Skin care can be a daunting maze of chemicals, preservatives, and additives that at times, seem impossible to navigate. And yet, natural options are just as confusing, with every product proclaiming itself to a cure-all. It seems far easier to stick with the mass manufactured stuff you see in store. But then, we have Aloe Vera. I’m sure you’ve seen the plants in home stores; with its wide splayed, thick leaves it’s hard to miss! If you slice the leaf open, you’re left with a gel that is absolutely incredible. And by this, we mean this gel can pretty much do anything. You can use this gel to condition your hair, treat fungus and dry skin to promote hair growth or when you will be needing the best sunburn treatment. This list will go on and on! Keeping a bottle of this clear aloe vera gel around the house will save you the hassle of having to care for a plant, of whom’s lifespan is entirely questionable. Instead, a bottle of the gel ensures a fruitful supply of something you’ll be able to use daily, as well as travel around with. The range of uses for aloe vera is near limitless; in this article, we’ll walk you through exactly what it does so you know when is the best time to take aloe vera gel and how to use aloe vera gel on face or for hair. We’ll also be revealing the best aloe vera gels currently available on the market so you can walk away with a purchase you know you’ll both use and love. When making our recommendations for usage, you can rest assured of our experience; with medical professionals guiding this article through, you’ll be certain of the best experience, with the best aloe vera gel. What About the Plant? How to Use It? 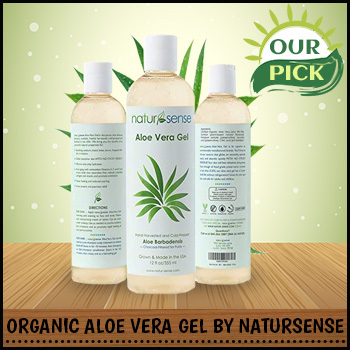 Top Pick: Nature Sense Organic Aloe Vera Gel- 12 oz. 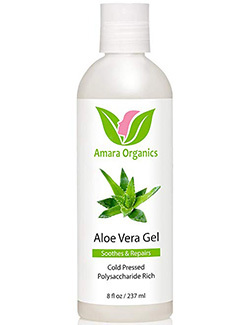 Runners Up: Amara Organics Aloe Vera Gel from Organic Cold Pressed Aloe, 8 fl. oz. Navigating the world wide web can be a tiresome affair, especially when article after article protests its validity. Or rather, some just list information that seems to make sense – and you’re left wasting your precious time reading false information. Here at Supplemania, we pride ourselves on our capability to provide well-researched articles, time and time again. Our team has over 5 years of experience under our belts; this results in knowing exactly what it is you’re going to want to know about something, as well as knowing exactly what you’re going to want from something. What we mean by this is, we structure our articles in light of full transparency; we tell you everything about our research, as well as the product. When we conduct our research, we analyze product descriptions against customer reviews again, and again until we have a list of ideal characteristics. We then used this list of ideal characteristics in our research of aloe vera products, refining the market down to its very best candidates. When we were researching the best aloe vera gels, we persevered for a full 18 hours to research a variety of brands and over 25 different bottles of the stuff. We then eliminated 5 candidates, then another 7, until we were left with the 13 very best aloe vera products currently available on the market. By allowing a number of individuals from our team to work together, as well as decide on the top rated aloe vera gels together, we made sure that this review is unbiased and neutral. The aloe vera products, we’ve worked so hard to narrow down, are brilliant for a range of skin conditions, as backed up with customers of all genders, ages and races’ feedback. The uses of aloe vera gel are endless. Some of the great uses customers have found with aloe vera include use in DIY beauty, after shave, razor burn cream, after sunburn cream for face, aloe vera gel moisturizer, and even a scalp mask. Aloe vera has been used for thousands of years to improve the health of countless civilizations. With a rich history of over 6,000 years of use, Aloe vera is something that practically works. As a succulent, it has rich, thick leaves that splay from its thick stem. The plants thrive in humid climates, with India being a big producer of Aloe vera; it can, however, be great for indoors should you want to pick up a plant for your home. Do bear in mind that having a plant means that your access to the gel is somewhat limited; you cannot cut every whole leaf aloe vera gel regularly as this will damage the plant. It makes far more sense to invest in some gel that you can use at every convenience. Aloe vera’s greatness lies in its chemical makeup. When looking at the clear gel, it’s clear that this stuff is high in water content; it’s actually 96-97% H2O, when you apply this stuff to your skin, it’ll instantly glide and sink, just like water would. Aloe vera gel skin benefits are countless in number. You can trust it not to clog your pores, and to moisturize well. Some aloe vera gels contain additives, like olive oil and oat milk – these additives intensify the emollient properties of aloe vera – perfect for extremely dry skin. The sort of Vitamins you can expect to find in aloe vera are B2, B6, E, and C. It’s also packed to the brim with a range of mineral-based anti-oxidants, active enzymes, and amino acids of which all work together to best promote skin health and wellbeing. The sort of effects all this has on the skin, are monumental. If you’re looking for something to transform damaged skin – aloe has got your back. Perfectly engineered for skin repair, anti-inflammatory action and anti-aging treatment, aloe vera will ensure your skin looks pampered and well looked after, no matter your age. Amino acids present in the gel work to replace any missing collagen and elastin that may have disintegrated within the deep layers of the skin. Aloe does this through a chemical called lignin, lignin allows penetration all the way down to the cellular level. This means that skin looks bouncy and fresh, and can even help with the treatment of fine lines and wrinkles. That is why people have been using aloe vera for sunburn, old scars, and face wrinkles from ancient time. When it comes to dark patches and uneven skin-tone, real aloe vera gel is your new best friend. The high levels of vitamin C help to ease away any dullness or patchiness, whilst vitamin E softens and treats the skin. The gel is also really high in an ingredient called aloin. When aloin is active (which it is in aloe vera), it leads to a process called melanin aggregation. Melanin aggregation helps to deplete the intensity of dark marks – making aloe vera perfect for scars or dark patch treatment. Saponin is another ingredient that has an added effect (on top of all the aforementioned goodness! ), saponin functions as a cleansing agent, and by working together with lignin and aloin eliminates any toxins within the skin; all the way down to the deepest layer, by bringing them to the surface so they can be washed away. Aloe vera essentially works backwards, in that it will internally penetrate to the bottom skin layers, find any toxins, and force them back up, and out again, which makes the aloe vera gel suitable for burns treatment. To add to this wonderful list of benefits, aloe vera is also a natural antiseptic helping to combat germs and disease. The gel itself is entirely anti-microbial, this means protection from germs in a natural shield that actualizes across the skin upon gel application. This shield is great for anti-inflammatory purposes and is often used to help combat UV rays and can soothe any damage caused by UV. If the idea of a pre-bought gel has left you a little skeptical, why not look into buying an actual aloe plant? Especially for the more green-fingered among you, having any sort of plant indoors can really freshen up a room. It’s all the better when this plant is a miraculous antidote for a range of conditions and ailments! Plus, they’re actually pretty simple to care for. If you’ve bought a sapling and want to pot it, make sure the pot you choose is wide, and use a well-draining potting mix. If you struggle to find what you’re looking for, go for the sort of thing you’d plant any succulent or cactus in; you could even try asking for help in a gardening center. Aloe vera plants are very robust; they’re pretty hard to kill. All the same, a lack of proper drainage will start the process, causing the leaves to wilt, and the roots to rot. Keep an eye out for any wilting leaves and consider repotting. Remember, this plant is used to the heat; be sure to keep it in temperatures between 55 and 80F, and place the aloe plant in indirect sunlight. When caring for an aloe vera plant, things couldn’t be more relaxed. As it’s essentially a succulent, aloe plants really don’t need much watering, and will thrive well with one deep watering every three weeks or so. Be sure that the soil is completely dry before watering; check the dampness level with your finger, if the soil is wet it’s best to wait until it’s all completely dry before watering. When it comes to using aloe vera straight from the plant, things definitely aren’t as simple as squeezing a tube. If you want the aloe you use, to be free from tannins, there’s a purification process you should put the leaf through before use. First off, choose your leaf. Always go for one near the base of the plant, and cut any leaf that seems particularly thick and out of the way. The next step is to carefully wash the leaf, (make sure you have a bowl of water ready!) then cut it horizontally, into small pieces, dropping them quickly into the bowl of water. You want the leaf to soak for at least a few hours, but ideally overnight. After leaving the leaves to soak in the water, you should notice that the water’s color has changed to a pinkish hue. This is confirmation of the release of any impurities from the aloe. You can now spill the pink water, before rinsing the aloe pieces. What you need to do now is peel the green rind of the leaf to get to the gel in the center. You can use a knife to carefully fillet the leaf but do mind that this process can be dangerous. If you’re choosing to do this with children or would rather keep extra safe, feel free to use a spoon to scoop/push out the gel from the center of the leaf. Most people tend to blend this 100% pure natural aloe vera gel to ensure even consistency, if you choose to do this please note that the aloe gel will be quite frothy post blending. After some time the fresh aloe vera gel will however settle and become vaguely translucent. You can use this mixture wherever your please; from the topical application on the skin to using it in the hair. Do note that this gel can be kept within the fridge for up to a week before you need to conjure up a fresh batch. You can use this aloe gel to mix with other fruit juice to create aloe juice. Aloe juice is amazing for your health with alkaline promoting properties, as well as its hydrating, phytonutrient-rich constitution resulting in improved liver health. It also means that you’ll hydrate quickly and effectively when drinking aloe juice. This also ties into constipation relief and heartburn relief! Drinking aloe juice means consuming a range of vitamins as well as a good amount of folic acid; this helps to promote clear, healthy skin. As you can tell, having an aloe vera plant may well be a worthy investment, especially if health is at the centre of your life (and you tend to have a little free time to spend harvesting the purest and best aloe gel). If you’re in a bit of a rush and regularly use the aloe leaf without purifying it first, you run the risk of reducing potassium levels in the body. Potassium is vital for cell interaction; any sort of imbalances in electrolytes can result in muscle weakness and potential cardiac problems. It can also aggravate kidneys if they’re previously compromised in which case kidney supplements could be of great help. Avoid aloe latex at all costs (this is the sticky yellow stuff on the underside of the leaf), as well as any products containing a high amount of the latex. If the aloe product you purchase does contain any of the latex from the leaf, it’s likely that any pre-existing intestinal conditions will be worsened, especially with frequent use. Avoid aloe with latex if you suffer from any intestinal issues; especially if you should have Crohn’s disease and/or colitis. There is also some evidence that aloe does affect blood sugar levels; therefore, should you suffer from diabetes be sure to monitor your blood sugar levels at a regular rate. 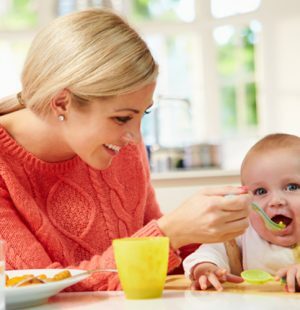 Do not ingest aloe should you be pregnant, or breastfeeding. Aloe’s medicinal properties can promote early contractions of which have the potential to aggravate pregnancy and result in later issues – do be wary. Some individuals do find themselves to be allergic or intolerant to aloe. Before using aloe topically, do a patch test on a small section of the skin; such as the underside of the arm. Leave the aloe for a few hours to monitor for any skin changes. If any irritation occurs do not use aloe vera. If any irritation surges after continuous use, it’s best to avoid using aloe, and to seek medical attention. Should aloe vera ever enter the eyes, it’s paramount you immediately wash the product out thoroughly with clear, running water. Do seek medical attention if required. Aloe blood sugar lowering abilities can negatively affect those taking medication. If you take insulin or hypoglycemic medication do monitor your use of aloe carefully. Aloe can also effect the effectiveness of Digoxin (taken for heart rhythm problems). Aloe promotes circulation and can sometimes slightly hinder blood clotting. Because of this, it’s important to avoid consumption and application of aloe before surgery, as the anesthetics you will be prescribed will also reduce blood clotting – resulting in an unaccounted for variable that may complicate recovery. We take our research seriously here at Supplemania, and have persevered to ensure that the process with which we decided on the best aloe vera gel products was both efficient and accurate. In light of full transparency with our wonderful readers, we’re more than happy to let you in on our research process. This means that you can know exactly how we did it, and have a stronger understanding on why our top aloe products are really the best. We started with over 16,500 user reviews of a range of 23 different aloe vera products that we carefully worked our way through. We were looking for products that showed customer satisfaction, with a good reputation from the company and strong ethics. When we analyzed the user reviews, we kept our eyes peeled for any characteristics and repeating themes showing averages of what users look for, need and acquired from the aloe products. We then used this information to compile a list of which we referenced during our research to really carefully pick what aloe products truly suit you. Our research report for this is available on our site for your personal scrutiny and reference. As if analyzing the products in such detail wasn’t enough, we then personally selected a group of volunteers to try the aloe products at home. We used this information to compare back to the internet research to determine which aloe products have the least amount of side effects. We then eliminated 3 aloe products that were the most problem ridden. With the 20 that were left, we researched the products across various online platforms, scouring the very wide web for any discrepancies we could spot, as well as any extra benefits. Doing this ensured a comprehensive, accurate list of every feature, side effect and customer opinion. Referring back to our little experiment with the volunteers, we were able to use all of the data we collected online to determine an accurate value to effectiveness ratio, as well as a full price index. We then shortlisted the 20 aloe products all the way down to our supplemania top 13, and have listed our personal scores of each aloe product on this very best aloe vera gel list. Vitamins A, C, and E – improving immune function, protecting against heart diseases and tumours. B1, B2, B12, B6, and B3 – improves nervous system function, helping improve mood as well as promoting the creation of new cells, promote fast hair growth, anti-oxidant properties, cleansing toxins and promoting digestion. Sodium – essential to muscles, nerves as well as blood pressure regulation. Magnesium – Reinforces the immune system and glucose regulation in the blood. Potassium – Helps cells release waste and protects blood vessels. If you’re feeling at all curious about any of the aloe vera products listed here, feel free to use the Amazon link to double check ingredients, and even contact the company itself if need be. All side effects, as well as a disclaimer will be listed on the packaging of the aloe vera product should you choose to purchase it. Using aloe vera very regularly, especially if the product contains anything other than the gel, can lead to adverse effects. Dosage advice and application instructions will be mentioned on the individual product. If you deem yourself to be in a vulnerable medical state, that is, should you be pregnant, breastfeeding, under 18 or of general ill health, do consult a doctor for medical advice before use. As with all good things, use to excess will result in negative repercussions. Some may find themselves allergic or intolerant to aloe vera and it’s worth bearing in this mind. For a detailed glance at what potential side effects could be, check above for our warning. In our top 13 best aloe vera gel picks we tried very hard to ensure that the products we listed have minimal side effects so the chances of you having any are limited. Do note that side effects can affect people differently; a friend might have an awful reaction whilst you may find yourself reaping every benefit of aloe vera’s goodness. 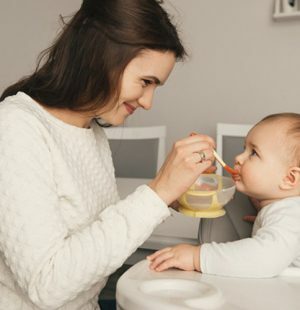 There’s no way to guarantee that you won’t have an adverse effect as it really depends on any allergies or intolerances you may have, along with countless other uncontrollable variables. Stay safe in the knowledge that these products do have side effects of very minimal severity and that the likelihood of suffering from any side effects with aloe vera are low (considering you have no pre-existing medical condition). 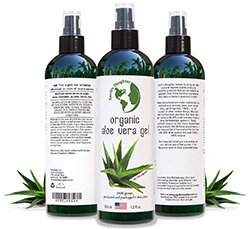 Aloe vera products are not regulated under the FDA all of the time. This doesn’t mean that the products aren’t safe for use however, as all will be scrutinized before being put up for sale, even before they get to our process of cutting things down. If you do find yourself suffering from any side effects when using aloe vera, immediately terminate use and consult a doctor for medical advice or assistance. With the use of our highly researched ‘ideal features’ checklist, we were able to hone down the entire internet’s offerings of aloe vera products to these 13.13 of the very best products you can hope to buy for anything aloe vera related. These products were chosen for their superior features, customer reviews and company ethos. We gathered all information about these products independently (no company sponsorships here! ), looking at product descriptions, company websites, FDA guidelines, as well as having our own mini aloe vera experiment with a group of volunteers. Each product has been rated with particular regard to its value: effectiveness ratio, in comparison to how much it costs. We’re basically going to tell you if the product works, if you get enough of it, and if it’s reasonably priced. We’ve even taken into consideration the potential life span of the aloe products listed here, so you can rest assured that your purchase will be a long-lasting investment in your pursuit of health. Price $13.89Prices are accurate as of April 21, 2019 at 05:06 AM. Product Prices and availability are subject to change. Any price and availability information displayed on Amazon at the time of purchase will apply to the purchase of any products. One thing that sets Nature Sense apart from the others on this list is the fact that it’s entirely family owned. Family owned companies are smaller, and have to be more scrupulous with the quality and ingredients used if they want to gain recognition. Nature-Sense is no exception to this rule with them developing highly effective products consistently on their US-based aloe farms. 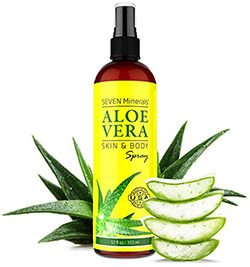 The company revolves almost entirely around aloe vera, they even create seasonal ranges of products that fulfill any issues that may arise with the heat or cold. They use a refined technique for aloe vera gel extraction that involves a highly refined charcoal filter, and cold pressing. This results in a product that is quite literally the purest of the pure and rated as Amazon’s top pick with over a thousand reviews. This is one of the only family produced gels, which took the first place on our list. It is packed full of a high percentage of aloe vera, and is great for irritated skin and nasty insect bites. Plus its good value too. This stuff is 99.75% just aloe vera. The high percentage of aloe vera means that effectiveness is maximized to an absolute extreme. You can trust this aloe vera body gel to relieve burns; be they the result of a razor or the sun. It’s also perfect for insect bites and any skin irritations around the face and even upon the body. If you’re just looking for a simple, fuss-free way to hydrate both, your skin, as well as your hair, this aloe vera gel has you covered (literally!) Plus, with it being entirely additive-free it’s safe to use on even children and pets! For a 12oz bottle of this gel, you’re going to be shelling out around $13. This is around 1.15USD per oz which is really a fantastic rate for some of the best aloe vera gel you can get. To use this gel on the skin, apply within a regular routine. Upon waking or just before falling asleep can be great times to apply this gel. Bear in mind that this stuff will have a thinner consistency than normal, but this is only because of the lack of filler (i.e. – plant-based thickener). Leave the gel to naturally soak into the skin. If you should need extra hydration you can apply a second coat, as needed. For hair treatment, mix the gel with shampoo and conditioner before massaging into the scalp, and into the hair. You can also potentially use this as a light hair gel, styling hair for the day with something that’ll naturally nourish it too! Always do a patch test before use; apply a small amount of the product onto the skin and wait a few hours to monitor any potential adverse reactions. Bear in mind that this product can cause allergic reactions for some individuals; this can result in hives, redness or potential breakouts. If you find yourself suffering any adverse effects post use of this, or any product do seek immediate medical attention and terminate use. 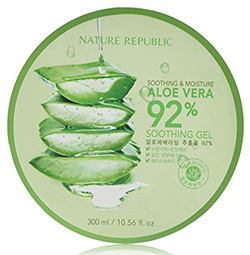 What makes this Aloe Vera gel our top pick? This product made the top of our best aloe vera gel brand list for a number of reasons, mainly, the insane amount of positive reviews surrounding it. This aloe vera gel has around 1726 customer reviews and an overall 4.5 stars on Amazon – making it pretty top of the range. When we were analyzing away, we were left astounded at the 12:1 positive-negative ratio of this aloe vera gel, which says a lot for this gel’s effectiveness. With a high review frequency of around 15 reviews per week, this is a clear best-seller. Although other aloe vera gel brands we’ve listed here also have positive reviews, none matches up the relentless positivity this aloe vera gel garners from its customer base. When looking at value and effectiveness, this gel truly is at the pinnacle. For a measly price of around $13, you can have brilliantly developed, refined, cold pressed aloe vera gel at your convenience. Preservatives often take up a heavy bulk of ingredients, especially with products such as aloe vera; of which can often turn quickly. 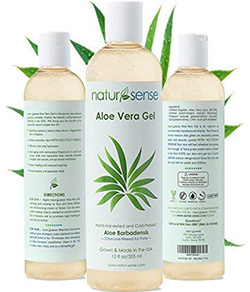 Nature Sense Organic Aloe Vera Gel is distinctly different in its advocation of fully natural preservatives that if anything, supplement the effects of the aloe vera itself! Most manufacturers like to bulk up their aloe vera gel with xanthan gum; this does make it thicker and potentially easier to use, but also reduces the actual amount of aloe vera product in the tube. 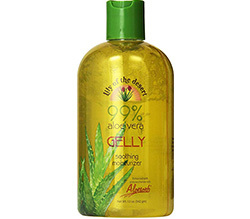 By maintaining the aloe vera content at 99%, you can be sure you’re getting amazing value for your money with this gel. The fact its cold pressed, with limited preservatives of which are entirely natural, as well as the ridiculously large amount of aloe vera actually inside the bottle – this aloe vera gel is our unquestionable top pick with a supplemania score of 9.8 out of 10. Price $15.95Prices are accurate as of April 21, 2019 at 05:06 AM. Product Prices and availability are subject to change. Any price and availability information displayed on Amazon at the time of purchase will apply to the purchase of any products. Amara Organics are a company that really pride themselves on their devotion to quality, organic ingredients. Their skin care products are highly regulated in manufacture, and endure intense clinical testing before ever meeting the public eye. All ingredients that enter each product are both organic and entirely non-toxic. 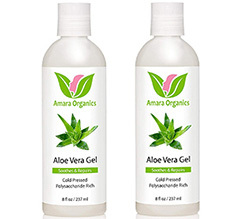 The Aloe vera plant gel sold by Amara cosmetics consists of 99.75% of the purest strain of cold-pressed Aloe vera. The very plants they actually use are grown in the USA, so you know that the money you’re spending is going right back into your own economy. The remaining 0.25% of ingredients are entirely natural preservatives that will keep the aloe vera fresh for long-term use. Amara aloe vera gel is nearly as popular as our favourite pick, but the only thing letting it down is its higher price tag. It is fab for skin and hair, and even improves wrinkles! Awesome! 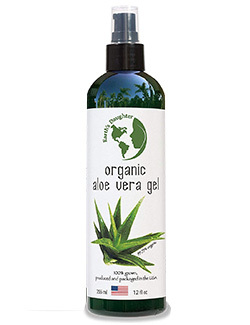 Amara organics list this aloe vera gel as the perfect emollient for not only skin but hair too. The company also recommends using aloe vera on the cuticles to soften skin and improve the look of hands. 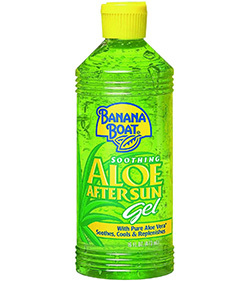 This aloe vera gel works fantastically for any type of burn; be it from the sun, or simply shaving a little too close. Above all else, it also improves wrinkles! 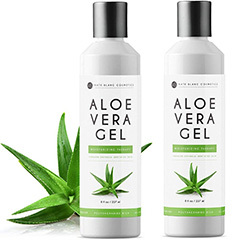 The site also recommends using this aloe vera gel as actual hair gel – as well as noting it’s safety with animals, meaning you can potentially use this on your pets too. For use in hair, mix with conditioner or shampoo and rinse as required. For use on skin, apply a thin layer and leave to air-dry without wiping away. For use on cuticles, gently massage a small amount into each nail bed before using a cuticle shaper to ease the cuticles into shape. Always do a patch test first! Some individuals may suffer from allergic reactions that can result in hives appearing on the skin, general redness or even itchiness. If you suffer prolonged negative effects, or notice any likely side effects do terminate use of the aloe vera gel and seek medical attention. What makes this Aloe Vera gel our runners up pick? With over 2600 listed customers leaving feedback, this product sells well; in fact, at a very similar high ratio of positive to negative reviews as our Top Pick, with similar effectiveness levels of the gel itself! The amount of reviews, at almost 3,000 makes this product the most reviewed out of all our aloe vera products on this list, and still, despite the frequency of reviews, this gel maintains a 4.6 star rating on Amazon. The consistency with which this product sells is also no less astounding, with an average 10 reviews every 5 days, as well as the earliest reviews at the time of research being a full ten at a mere 5 days ago! The one point on which this product falters, is its cost. With a higher price of around $15, this aloe vera gel just doesn’t have the same value quality as our top pick, meaning we had to settle for placing it second, with a supplemania score of 9.5. Price $6.31Prices are accurate as of April 21, 2019 at 05:06 AM. Product Prices and availability are subject to change. Any price and availability information displayed on Amazon at the time of purchase will apply to the purchase of any products. Lily of the Desert is a massive name in the aloe vera industry. With countless company-owned farms, processing facilities and a unique manufacturing process honed over decades of experience, this is the place to go for quality aloe. They base most of their farms in Texas, as well as Mexico; making use of the hot climate to grow quality aloe that retain their natural properties. 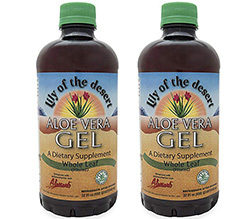 Lily of the Desert are right at the forefront of the aloe vera industry, being the current leading producer of aloe vera gel juice products; with their items stocked in over 99% of all health food stores and groceries in the USA. Lily of the Desert’s aloe vera gel is unique in that it’s manufactured entirely to be drinkable. They do offer some other aloe based drinks that are slightly more watered down, but this gel is brilliant for its purity. Plus, above all else, the thickness of the gel actually helps to soothe the throat as you drink; binding to the walls in a comforting manner. The gel has around 200 biologically-active components of which will nourish and even restore health and vigor. This gel is actually a drink, that you can water down to your favourite consistency. It is really good value, and comes from a reliable and well-known brand leader. We’ve all come to grips with what aloe does when you simply apply it on the skin, but actually consuming this stuff opens a whole other universe of benefits. 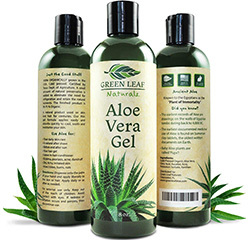 Aloe vera drinking gel helps to ensure that the digestive tract stays replenished and healthy. It also actually reinforces the immune system with the high number and range of B vitamins. Other chemicals help to eliminate toxins from cell membranes and process these toxins outwards. Having this aloe vera as a drink alongside a meal can be a great idea; with it actually increasing the amount of nutrients absorbed in the bloodstream – so you can get the most from your food. It can also be a substitute for milk of magnesia, in settling acidity issues in the stomach. This aloe vera juice is also believed to be the best aloe vera juice for acne and other skin treatment according to the best aloe vera juice reviews by the consumers. Many people have also had success using this product to help soothe muscle and joint discomfort, with the nutrient-rich aloe vera helping to restore collagen and reduce swelling. Certainly, it is one of the best aloe vera gel drinks available on the market. Now, to how to prepare this amazing stuff. You’re going to want to consume around 1-2 oz per serving, and not exceed 8 oz within a day. You can mix the aloe vera gel into another drink, or simply drink it straight (especially if you enjoy the thick texture!) If you’re planning on taking aloe vera to help with digestion, it’s a good idea to drink a portion around 30 minutes before taking your meal. The product must be consumed within 5-6 months after opening and refrigerated as soon as the seal is broken. The great thing about this product is the fact that you can give it a trial run by purchasing a smaller bottle. The aloe vera gel comes in three different sizes; one 16fl oz, one 32fl oz, and one 128fl oz bottle. There are also two different types of the gel you can purchase; one being the ‘whole leaf’, and the other being ‘inner fillet’. It’s worth bearing in mind that both products will have the same benefits; including, immune system support, digestive improvements, nitrate reduction, and anti-oxidant boosts. However, the distinction lies in both taste and effectiveness. Tests by both the company and us show that whole leaf gel is slightly superior in maximizing benefits. Unfortunately, this does come at the price of a slightly more intense taste. Inner fillet gel still does have the same benefits, to a slightly lesser extent, but! With a milder taste that may well be more agreeable if you’re just starting out on this aloe journey. Aloe vera will negatively react with diabetic medication and some heart medication; see the side effect section at the top of the article for more details. Generally, there are few side effects with aloe vera; most of them stem from the latex being toxic, however, if you stick to the inner leaf formula you’ll be in the clear. Typical allergic reactions include redness, hives, and rashes. If you should find yourself suffering from any side effect, terminate use and seek immediate medical attention. Why this is our drinkable pick? This aloe vera gel is completely versatile; you can dilute it to be thinned, or if you enjoy a thicker texture drink it as is. The potency of the formula is proven by countless positive customer reviews to be effective and reliable. The option of both full leaf and inner fillet aloe types allows customers to make a suitable decision for their individual condition. With an overall 4.3 stars on Amazon and around 1103 reviews, this drinkable product has a strong moderate score and sells well. It’s worth bearing in mind that as this is a consumable, taste is subjective and reviews can be impacted by personal disposition. The overall effectiveness of this product was judged as surmounting which led us to look further. When we looked at the value: price ratio, we were astounded! This product will allow you 320z for about $6 – that’s just about 30 cents per ounce, allowing you 16 full servings from a 32oz bottle. We awarded this product a Supplemania Score of 8.9 stars due to its mixed reviews and lower positive: negative review ratio. We do however value its effectiveness and the versatility of the product, which led us to place it as our recommended consumable. Price $9.99Prices are accurate as of April 21, 2019 at 05:06 AM. Product Prices and availability are subject to change. Any price and availability information displayed on Amazon at the time of purchase will apply to the purchase of any products. Kate Blanc is a California based skin care brand that has been certified by the USDA as 100% pure organic aloe vera gel. You can rest your mind at ease if all-natural is your prerogative as Kate Blanc are so official in their natural status, they’re even registered with the California Department of Health. What this means for the aloe vera they produce is, it’s made under strict manufacturing standards, with high attention to detail, research and effectiveness. Their aloe vera products are ensured by this sort of attention to detail to be of a very high standard, without having a helping hand from artificial additives. The aloe vera produced by Kate Blanc is both pure and natural this results in a potent formula that is both effective, and totally organic. It’s been used successfully by a huge number of customers to not only moisturize, but help alleviate discomfort with medical conditions. Kate Blanc’s website references particular effectiveness with acne (maybe even being the best pure aloe vera gel for face scars), bald spot treatment, hair replenishment. 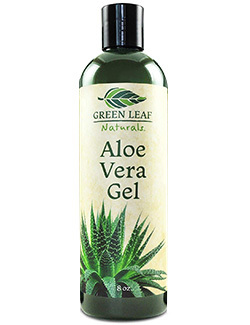 This Aloe Vera leaf gel is superstar amongst its peers, because everyone loves it! For such a low price you get a natural gel that is cold-pressed and packed full of wonderful aloe vera in the bottle. Application to the scalp regenerates skin on the scalp to encourage hair growth and soften hair. This aloe vera product is noted to limit breakage and promote a healthy shine and bounce through aloe’s natural keratin-like protein stores. According to our research team and customer reviews, we have found that it is the best aloe vera gel for acne treatment i.e. it is good for removing acne scars from acne-prone skin, exactly what you deserve from a good supplement for acne. You can use this all-natural aloe vera gel product on your animals due to its highly pure, organic nature. Should your cat or dog have bald patches or itchiness, this stuff will help to alleviate soreness. Bringing it back to you, this aloe vera product is amazing for soothing burns and replenishing cell growth; limiting scarring. If you’ve been out in the sun too long or simply shaved a little too close, this aloe vera gel fairness cream will be your saving grace. For use as a hair mask, use around half an hour or an hour before you intend to have a shower. Gently massage the aloe vera gel into the scalp before rinsing. For use with conditioner and shampoo, simply squeeze a small amount of aloe vera gel into the palm of the hand alongside your conventional product; use as normal, rinsing as you would. For use on the skin, topical application should be lightly applied and left to air dry; don’t be tempted to wipe away residue! Let it all sink into the skin to reap the benefits to soften and repair dry, cracked skin. Side effects are often allergy based or can be associated with medicinal interference. Rashes on the skin or sometimes raised redness may occur. If you find yourself suffering from any side effects do seek immediate medical intervention. Price $16.75Prices are accurate as of April 21, 2019 at 05:06 AM. Product Prices and availability are subject to change. Any price and availability information displayed on Amazon at the time of purchase will apply to the purchase of any products. 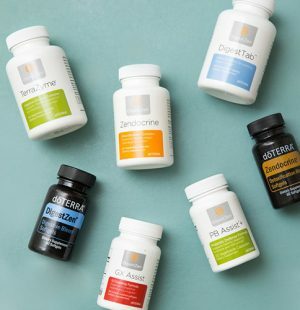 Seven Minerals are a family owned business dedicated to providing the public with a deeper understanding and knowledge of how to live healthily, and why! Their website is full of easy to understand information on every product they sell. Their company focuses on organic, natural, ethically sourced ingredients put together in the least toxic way. This results in products that are safe not only for adults, but even for children too – making their items entirely family friendly. 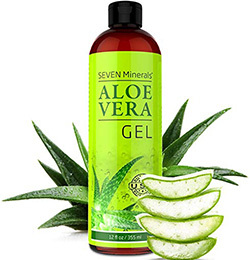 Seven Minerals aloe vera gel is produced entirely in the US, both in design and production. The spray has consistently 845 consistently positive reviews on Amazon and an overall rating of 4.5 stars, making it a clear bestseller. This pick is all about a healthy ethos. It is one of the most organic and ethically sourced options on our list. It is actually a spray, so is great for hydrating your skin deep down. This aloe vera spray is noted to be perfect at moisturizing and hydrating skin right down to the deepest level. This results in dry and cracked skin being repaired effectively, and often quickly with a pump of the spray-top! The essential fatty-acids within the aloe vera help to improve wrinkles and even out blemishes. For some, it can even help to cure acne! It’s perfect for any type of burn or skin irritation, with the gel consistency soothing instantly upon contact. If you’ve been out in the sun all day and want to attempt to replenish your skin, grabbing a tube of aloe vera spray is definitely your best bet. It’s also perfect for use on the nails, with aloe vera’s chemical composition similar to keratin (the stuff your nails and hair is made of), this means stronger nails, as well as soothed and softened nail beds. 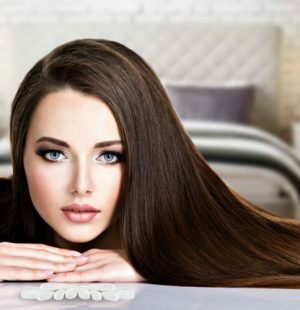 In mentioning keratin, this stuff has got to be good for hair too – and it is! It’ll soften hair and rejuvenate the scalp, often eliminating dandruff! For a 12oz bottle, you can expect to pay around $16. When you consider that’s just over a dollar for an ounce it really is a reasonable deal. To use on the skin, apply topically and allow the gel to air dry. If you’re intending on using this for hair, try massaging into the scalp and strands around a half hour before washing through. You can also mix in the gel with shampoo and conditioner for convenient replenishment. Some individuals do find themselves suffering allergic reactions as a result of using aloe vera. These effects often include raised rashes, hives or simply irritated skin. Aloe vera can also interact with medication; do check the side effects section at the top of the article for more details. If you should find yourself suffering from any adverse effects whilst using aloe vera, immediately terminate use and seek medical attention. Price $19.95Prices are accurate as of April 21, 2019 at 05:06 AM. Product Prices and availability are subject to change. Any price and availability information displayed on Amazon at the time of purchase will apply to the purchase of any products. We’ve thrown in another Seven Minerals product here, just because of how consistently positive their reviews are and how well their products perform. Their website is chock full of easy to understand information on all their items, including this, being one of their best aloe vera gels! Their company focuses on organic, natural, ethically sourced ingredients put together in the least toxic way. This results in products that are safe not only for adults, but even for children too – making their items entirely family friendly. 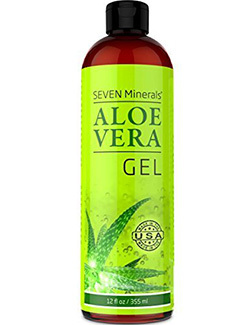 The aloe vera produced by Seven Minerals has been entirely US developed, both in design and production. The gel has consistently 226 consistently positive reviews on Amazon and an overall rating of 4.5 stars, it clearly sells well. This gel is perfect for massaging into skin, and is even better for a relaxing aloe vera treatment! This is one for people who have spent too much time in the sun and need hydrating. This gel is the perfect stuff for massaging into skin as a pamper treatment you know you’ll reap the benefits from. This aloe vera anti aging cream is full of antioxidants and fatty acids that rejuvenate tired, dull skin. It can even promote collagen, especially through the way it permeates all the way through layers of skin and soothes deep down. This makes it perfect for if you’ve just come in from the sun. It’s also great for dandruff or itchy scalp; using it on hair doesn’t have to stop there of course, applying it to the strands will make your locks completely luscious. In Fact, it has been found by our research team that it is one of the best aloe vera gel for hair growth, hair styling and skin sunburn treatment. You can purchase a 12oz bottle of this aloe vera gel for around $19, note that it does occasionally go on sale though! And that this is still only around 2 USD per ounce! You can purchase this aloe vera gel in two convenient sizes; a 12fl oz bottle for keeping at home to use regularly with the whole family, and a little 2fl oz for on the go! Shake well, then apply the gel carefully, massaging it into the skin if used topically. If you intend on using this on hair, massage it into the strands and leave for around half an hour before rinsing. Alternatively, mix the gel with shampoo and conditioner and use it in the shower! You can also use this stuff for burns or abrasions. Some even use aloe vera to treat bug bites (or if you’re English, insect bites!). Always do a patch test before using any new skin product. Some individuals report allergic reactions to aloe vera, and aloe vera can potentially negatively react with some medications (check our side effects section further up for more details). Do be aware that there is the potential of rashes, dry skin and redness. If you do find yourself suffering from any adverse effects post use, terminate use and seek immediate medical attention. Price $19.87Prices are accurate as of April 21, 2019 at 05:06 AM. Product Prices and availability are subject to change. Any price and availability information displayed on Amazon at the time of purchase will apply to the purchase of any products. Earths Daughter pride themselves on their affiliation with nature that is evident with just their name! They really inhibit the amount of thickeners in their aloe products to ensure that as much of the gel as possible gets to you. Do bear in mind that the consequence of this is a watery solution that may be a little trickier to apply in some ways. However; it does absorb remarkably well and does have over 1,000 positive reviews and around 4.5 stars on Amazon! Impressive stuff indeed. They also offer a lifetime guarantee on their products, which means that should you find that it just doesn’t work for you after trying it for a while, you won’t have lost out on any money! It’s a total win-win situation. This gel is all about being at one with nature. The brand focuses on using as much aloe vera as possible, and as little of anything else that is added artificially. Aloe vera is soothing, cooling and perfect for a range of skin ailments. If you’ve been burned via the sun, or even a razor, this stuff has your back. The aloe vera cream is also amazing for treating general skin irritation, and even treating and guarding against eczema. Aloe vera is not just limited to skin use; it’s brilliant for your hair and can replenish lost proteins to ensure a thicker, healthier mane. It even helps cure dandruff and buildup of dead skin cells, fade scars and stretch marks! You can even make aloe vera juice recipes right at your home! You can expect to pay around $19 for a 12oz bottle of this aloe vera gel. If you’re feeling a little put off by the price, think back to the reviews!! And the fact that’s only around 2USD for an ounce. Apply just enough aloe to completely coat the area lightly. You don’t need much as the aloe is quite thin and will quickly absorb to get to work. Do note that effects aren’t always immediate, and for more extreme skin concerns it can take a few applications before seeing any results. If you like, you can apply more than one coat within a few minutes, due to the rate at which the product absorbs. Always do a patch test before use! Some individuals can be allergic to aloe vera and suffer from hives, dryness or red skin post use. Some medications also negatively interact with aloe vera, do be sure to read through our full side effect section at the top of the article for more details. If you should suffer any adverse effects post use seek immediate medical attention. Price $11.95Prices are accurate as of April 21, 2019 at 05:06 AM. Product Prices and availability are subject to change. Any price and availability information displayed on Amazon at the time of purchase will apply to the purchase of any products. 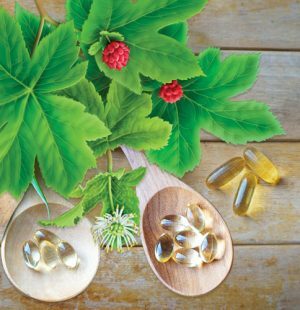 Green Leaf naturals are so confident in their products, that they offer a 100% customer satisfaction guarantee on every product they sell – this piqued our interest here at supplemania. We looked further, and found that the company actually cold pressed aloe vera that they themselves grow, right in Texas! The plants are even certified under the Texas Department of Agriculture. The gel they create contains 99.75% of pure, organic aloe vera, with only a minute amount of 0.25% consisting of all natural preservatives and a tiny amount of xanthan to aid the aloe’s application process. This all-natural aloe vera gel is perfect as a moisturizing treatment for your skin; day or night. It’s quick to seep into the skin and permeates right down to the deepest layer so you can be sure of full, effective hydration. It’s also brilliant for using in your own DIY beauty projects; why not whip up a hair or face mask with this aloe vera gel as your primary ingredient? Eliminate blemishes and clear acne in an instant. With how gentle and soothing aloe vera is, it’s perfect for after-sun care, or even an all-natural aftershave alternative. It can leave a light hold; so can be great for use as a hair gel that will actually nourish! You can buy an 8oz bottle of this brilliant stuff for around $15. That means that it costs around a measly 1.50 USD for an ounce! What a bargain. So, maybe you’re feeling a little skeptical and just want to try things first, Green Leaf Naturals have your back with 3 different sizes available! A 3.3fl oz is perfect for traveling, or if you just want to double check the effects for yourself. A 12fl oz, and an 8fl oz bottle are also available should you decide that you really can’t get enough of the stuff. Squeeze a small amount of gel from the bottle, and apply to the skin – tapping to ensure optimal absorption. For use with hair, gently massage the gel into hair before washing as a hair mask, or mix in with shampoo/conditioner for in shower use. Always do a patch test to ensure the product’s compatibility with your skin! Aloe vera is fantastic, but that doesn’t mean it’s perfect. People can be allergic to aloe vera and it can in fact interact negatively with some medications! Check our side effects section at the top for more details. Do be aware that aloe vera can cause redness, hives or rashes as per allergic reactions. If you find yourself suffering from any negative effects after use, terminate use and seek immediate medical attention. Price $6.34Prices are accurate as of April 21, 2019 at 05:06 AM. Product Prices and availability are subject to change. Any price and availability information displayed on Amazon at the time of purchase will apply to the purchase of any products. We’ve all heard of the Korean beauty hypes around the internet, with glass skin being heralded as the result of the intense Korean 10-step routine. What if we told you, that there’s a Korean company that produces fantastic aloe vera gel that pretty much encapsulates the effectiveness of any good skin care routine? Nature Republic offers convenient, effective aloe vera solutions that work so well that they often sell out even on Amazon. 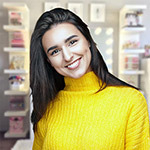 They package their items well; often with a modern take on things, so you can be sure that the gel you’re buying won’t look amiss on your dresser. The aloe vera gel they offer constitutes of 92% aloe vera. Now, we know! 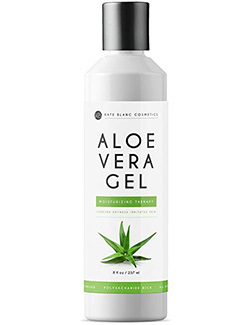 This is a far lower percentage than most other brands we have here, but the added ingredients (most are artificial), really complement and enhance the effect of the aloe. Plus, with over 363 reviews and 4.5 stars on Amazon, we couldn’t resist adding this one to our list. This gel is a Korean favourite. They are well known for their expert beauty regimes, so look no further than this gel. A favourite product with some beneficial added ingredients. You can use this stuff on your skin just to moisturize, as a face mask, or even a hair mask! You can mix it with your conditioner and shampoo, use it to soothe swollen eyes, or even massage it into cuticles for pretty nails. Its soothing properties make it ideal for after-sun care, or even to treat sun and razor burns. This aloe vera gel is reasonably priced, costing about $6 for a 10 oz container! That’s under a dollar for an ounce! If you’re looking to pamper yourself, why not try mixing a few drops of good quality facial oil (jojoba and almond are great), with aloe vera gel for a freshly concocted moisturizer that will help you to get relief from eczema and psoriasis in moments! Aloe vera can also be mixed with foundation and concealer to ensure optimal product absorption as well as promote a glowing complexion. If you want to use this stuff all over your body, but don’t want to waste too much product, why not try mixing it with a carrier oil, like olive oil, and massaging the two products together. This aloe vera gel is also fantastic at helping to heal split ends due to its chemical makeup mimicking the very stuff hair is made of! Unfortunately, not even aloe vera is faultless, and some people do find themselves allergic to the stuff. 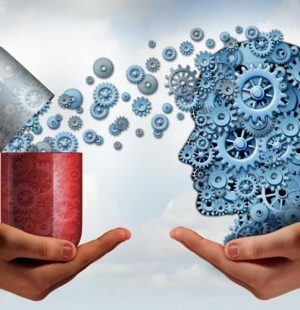 It can also interact negatively with some medications, details of this are listed in our detailed side effects section further up so scroll away! 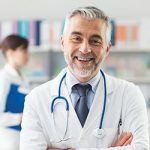 Do bear in mind that should you find yourself suffering from rash, hives or dry skin, you may well be allergic – terminate use and seek medical attention. Price $6.15Prices are accurate as of April 21, 2019 at 05:06 AM. Product Prices and availability are subject to change. Any price and availability information displayed on Amazon at the time of purchase will apply to the purchase of any products. We’re coming back to this fantastic brand in light of its continued success in the aloe vera market. Just as a little recap, this company base most of their farms in Texas, as well as Mexico; making use of the hot climate to grow quality plants. 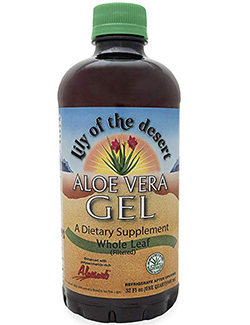 Lily of the Desert is right at the forefront of the aloe vera industry, being the current leading producer of aloe vera products; with their items stocked in over 99% of all health food stores and groceries in the USA. Their aloe vera gel is incredibly effective with around 552 customer reviews on Amazon rating this product a strong 4.5 stars. This gel is made by one of the leaders in the market, so doesn’t disappoint. 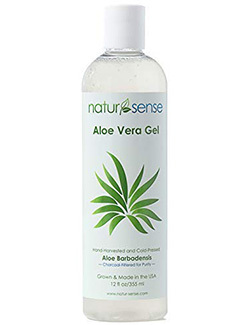 It is a really effective gel, and reasonably priced, so a solid option for a reliable aloe vera product. If you feel your skin is in need of soothing, aloe vera gel is definitely the way to go. It permeates through most layers of the skin ensuring results. Post sun, this gel will nourish your skin back to health; try using it after any sort of burn to reap its benefits. It soothes any irritation quickly and effectively, as well as enhancing the natural complexion. It’s perfect for use in hair too; nourishing the strands, it’ll be sure to condition hair and reduce frizz/dandruff. It’s also great for your hands and can improve the quality of nails in an instant! At around $5 for a 120z bottle, this aloe vera gel is very reasonably priced. Especially considering the nature of the brand and its reliability – you’ll only be paying around 0.90$ an ounce. To use upon skin, gently pat the product to promote absorption. You can mix the aloe vera gel with facial oils for a thinner consistency and enhanced absorption. It’s perfect for use in hair too; simply massage the aloe vera gel into the strands, focusing on the ends should you suffer from split ends. You can even mix the gel with your standard hair products for extra nourishment! Some do report allergic reactions to aloe vera, this may result in rashes, hives or red skin. Alternatively, aloe vera can negatively interact with some medications, details of this are at the top of the article under the side effects section. Should you happen to find yourself suffering from any negative effects post use, terminate use and seek immediate medical attention. Price $77.98Prices are accurate as of April 21, 2019 at 05:06 AM. Product Prices and availability are subject to change. Any price and availability information displayed on Amazon at the time of purchase will apply to the purchase of any products. 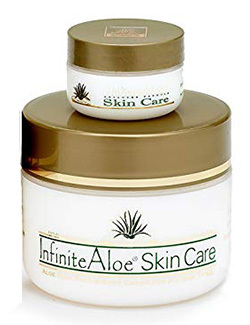 By combining carefully selected natural and advanced solutions to enhance the effectiveness of aloe vera, InfiniteAloe Skin Care has established themselves as part of a regimen of self-care moisturizer for a wide variety of skin conditions. Its 20 years success in Aloe vera market tells the story behind its positive ratings by the users of Infinite Aloe costco aloe vera cream. This aloe vera gel has a great track record of keeping customers happy for many years. It is perfect for people with lots of different skin conditions, and leaves you feeling soothed and cool every time. Aloe vera is soothing, cooling and perfect for a range of skin ailments. If your face has been burnt by the sun, or even a razor, this stuff can be of help. This is one of the best pure and organic aloe vera gel / cream/ lotion for sunburn to prevent peeling. The aloe vera gel is also amazing for treating general skin irritation, and even treating and guarding against eczema. The use of Aloe Vera is not just limited to skin use; it’s also used in many of the best hair products available on the market today which can replenish lost proteins to ensure a thicker, healthier mane. It even helps cure dandruff and back to the skin, fade scars and stretch marks. 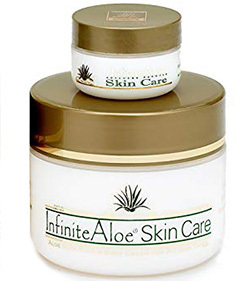 The price of Infinite Aloe aloe vera gel is around $90. You will get 2 piece of 8 oz jars and 2 pieces of 0.5 oz travel jar in this package. The price of this product is the highest in comparison to the other products in our best aloe vera gel list. For best result, use after shower or cleaning your face, when the skin clogs are open. Continuous daily uses is recommended for a good result. Some medications also negatively interact with aloe vera, do be sure to read through our full side effect section at the top of the article for more details. If you should suffer any adverse effects post use seek immediate medical attention. Price $21.95Prices are accurate as of April 21, 2019 at 05:06 AM. Product Prices and availability are subject to change. Any price and availability information displayed on Amazon at the time of purchase will apply to the purchase of any products. 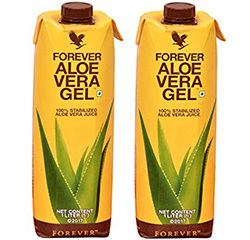 Forever living aloe vera gel is one of the best edible aloe vera gels available on the market. 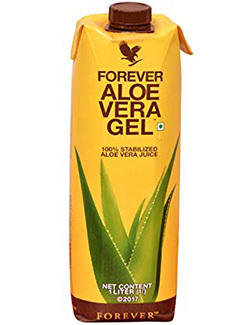 Forever aloe vera gel drink contains 99.7% aloe vera juice with no added preservatives. It is completely sugar-free, gluten-free and rich in vitamin c. Drinking Forever Living Forever Aloe Vera Gel regularly benefits the body by strengthening the digestive system. This aloe vera gel comes as a drink which is clean and without added ingredients. It is an easy way to get some great aloe vera into your body, and really boosts your digestive system. Aloe vera drinking gel helps to ensure that the digestive tract stays replenished and healthy. It also actually reinforces the immune system with the high number and range of B vitamins. Other chemicals help to eliminate toxins from cell membranes and process these toxins outwards. The price of an 1 liter forever living forever aloe vera gel drink is around $27. You can consume around 250 ml per serving. You can mix this aloe vera gel into another drink, or simply drink it straight (especially if you enjoy the thick texture!) If you’re planning on taking aloe vera to help with digestion, it’s a good idea to drink a portion around 30 minutes before taking your meal. Aloe vera will negatively react with diabetic medication and some heart medication; see the side effect section at the top of the article for more details. Generally, there are a few side effects with aloe vera; most of them stem from the latex being toxic, however, if you stick to the inner leaf formula, you will not face any side effects. Price $17.97Prices are accurate as of April 21, 2019 at 05:06 AM. Product Prices and availability are subject to change. Any price and availability information displayed on Amazon at the time of purchase will apply to the purchase of any products. 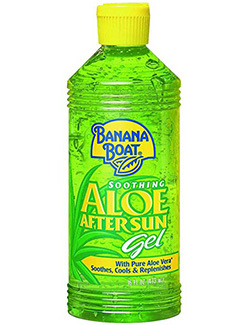 Banana Boat Aloe Vera gel is the last popular aloe vera brand that made its place in our best aloe vera gel product list. This is a great cream to protect your skin from sunburn. This product soothes and moisturizes skin and supply proper nutrients to the skin layer. It also works great in healing burned skin. This aloe vera gel is all about keeping your skin happy after too much sun. It is great at keeping your skin soothed and moisturized, whilst also doing a great job of repairing Andy sun damaged skin. You can purchase a 16 oz bottle of this aloe vera gel for around $37. Shake well, then apply the gel carefully, massage it into the skin if you use it topically. If you intend on using this on hair, massage it into the strands and leave for around half an hour before rinsing. Alternatively, mix the gel with shampoo and conditioner and use it in the shower! Some individuals report allergic reactions to aloe vera, and aloe vera can potentially negatively react with some medications (check our side effects section further up for more details). Do be aware that there is the potential of rashes, dry skin and redness. If you do find yourself suffering from any adverse effects post use, stop use and seek medical advice immediately. ArtNaturals Organic Aloe Vera Gel – for Face, Hair and Body – 100% Pure Natural and Cold Pressed Aloe for Aging skin, Sun Burn, Eczema, Bug or Insect Bites, Razor Bumps and Acne – 12 oz. An ancient ingredient that has withstood the test of time should never be taken amiss. Aloe vera is something that has remained a core ingredient in not only skin care, but medicine for thousands of years. As something that promotes good health in an unbelievable number of ways, from treating frizz, eczema, scratches, small cuts, bruises, scars, stretch marks all the way down to countless other skin conditions or ailments. in using aloe vera, you’re placing your trust in its history, reliability, and effectiveness. Our article here today walks you through the different ways you can gain access to this remarkable plant’s benefits; from growing it yourself, to purchasing it in its different forms. Although having the plant can be a wonderful asset, actually caring for it and processing its leaves through can be a time-consuming process. If you’re really set on consuming aloe vera regularly perhaps having a plant might be a nice backup should you ever run out of a product. Otherwise, the internet market especially opens up a plethora of aloe vera options that you can scroll through to your heart’s content. 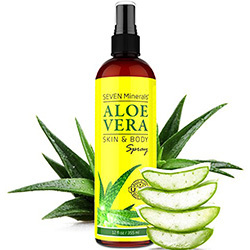 The items we’ve picked and reviewed here today are superior not only in their function, but in the purity of the aloe vera, the ethics behind the companies themselves, as well as their continued success with customers. We here at Supplemania hope you’ve found our research helpful, and encourage you to look through our report should you have any nagging doubts to set your mind at ease. For now, enjoy the best aloe vera gel from these 13.